Letters to Elijah: Snacks for 23! Is it possible to make a snack for 23 and not cost a fortune? Sure it is! Elijah's preschool has parents take turns bringing in a healthy snack. 20 kids + 2 teachers + 1 parent = 23 hungry people. 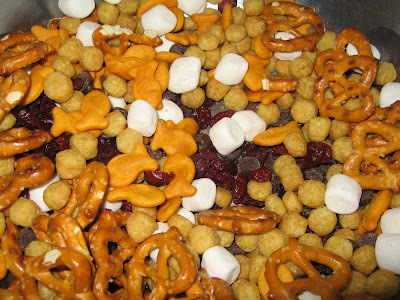 First, I want to thank my friend Beth for coming up with the idea of trail mix for a snack. 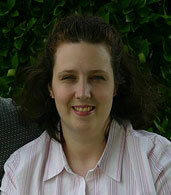 She reads this blog so I better give her some credit! Thanks Beth! 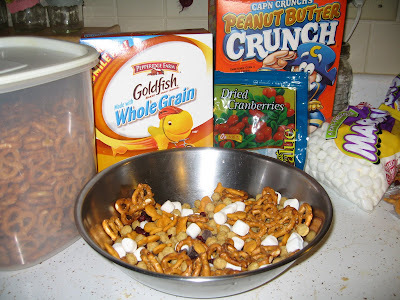 Homemade Trail mix is awesome frugal snack idea. 2/Use only what you have on hand. No spending gas money going to the store with this recipe! Get your kids involved. We only put items in that Eli likes. Total Cost: $2.60/23 = 11.3 cents per serving! Yeah! The kids at school loved it. Everyone got something they liked. I packed the trail mix in little snack size baggies. This way I was able to prepare the night before and had no clean up! Simple! I would love to hear some of the frugal snacks ideas you have! P.s. Your apple cider tea sounds yummy! Ah, I was hungry when I came here, now I want a bowl of that snack!! !